The Storre/Storer/Storrer family can be traced back to 1182 in Speyer, Germany. Here, Swiggerus Storre was a ministerial officer. The next time the name occurs it is as one Cunradus Storre, an armiger, witnessed by Herman the Storer, in 1296 in Swabia. 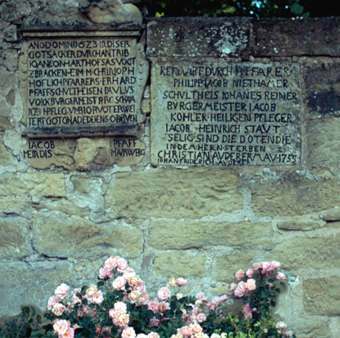 Then two years later is recorded Kontad Storer and his wife Mechthild, dated 18 August 1298. Speyer became the see of a bishop in the 7th century and was made a free imperial city in 1294. 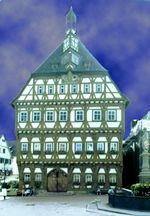 Between this year and 1570 no fewer than 50 diets [meetings of the rulers of the Holy Roman Empire] were held here. 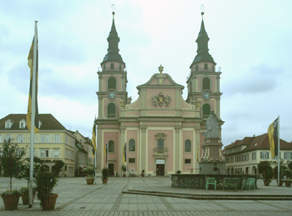 Its Romanesque cathedral of St Mary and St Stephen, a.k.a the Kaiserdom, is the largest in Germany of this period. Construction began in 1030 and it was consecrated in 1061 Eight emperors and kings are buried in this cathedral. 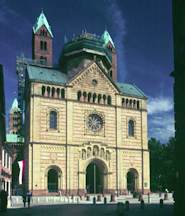 Speyer was a center of Roman administration of Germany. 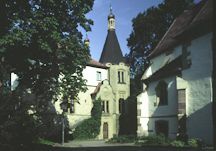 The summering place, and often administrative center, for the bishops of Speyer was Deidesheim, 21 km west northwest from Speyer, or about 27 km by the roads of the time. 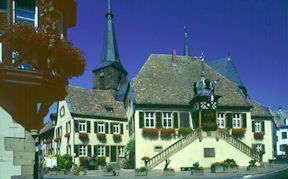 The Town Hall (Rathaus) and interior of the Deidesheim church, not much changed from a century or more ago. Speyer is on the left bank of the Rhine about 25 km south of the point where the Neckar flows into it. Heidelberg is then some 20 km up the Neckar and it is another 20 km before the Necker makes a 90° turn as it flows north from Stuttgart. 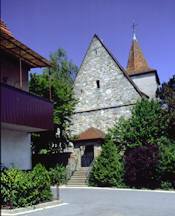 Stöhrers are found in Gauangaloch a short distance south over the mountains from Heidelberg. 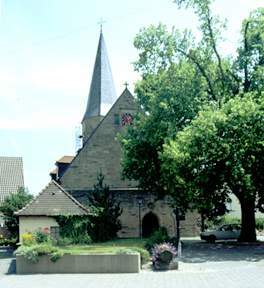 Brackenheim is about 35 km north of Stuttgart. East from here is a long valley leading through Dürrenzimmern and Nordhausen to Nordheim and Bockingen, just outside Heilbronn on the Neckar. West, at the end of the plain that becomes a valley is Eibensbach. C: 14 May 1706 ?? Anna Barbara STöHRER (F)..  B: 17 Nov 1718. M; Barbara Magdalena STöRRER (F). Markgröningen is in rolling hills northwest of Stuttgart. Schweiberdingen is immediately south and Hemmingen a bit further, southwest. 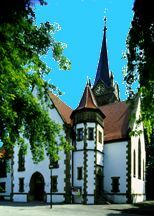 Northwest, across the mountain from Eibensbach, is Ensingen. 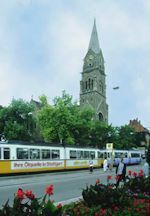 In our journey up the Neckar valley and surrounding plains, luscious farming country and forest preserves, we finally arrive in the vicinity of Stuttgart itself. Since our family crest features a stubborn tree stump that does not easily come out of the land that is being cleared for farming, we believe that early Storrer families were land-owning farmers first, carpenters and other farm-related trades second. Only in this century have Storrers moved out into professions on a major basis. Engineering seems to be popular, and we have more than a few PhDs in the family tree. Siegfried Richard F STOHRER (M)..
Then, where do we put Ettlingen in our listings? 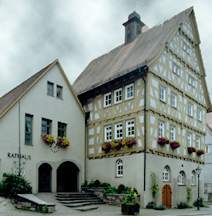 It is all by itself, as far as Storre towns go, a short distance south of Karlsruhe in a rather narrow valley. Here Storre is spelled Störer and Stöhrer, somewhat indiscriminately within a given family. Male names repeat incessantly but, as we do not yet have the families of the wives, we cannot be certain which son belongs to which father when there is a gap or more than one son with the same name. Did Störers come west out of Stuttgart, or from the nearest "Storre" Town, Ensingen, or on the route southwest to via Calw to Villingen? 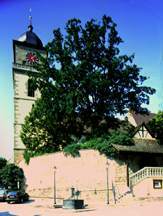 We have no evidence yet of the specific reason the first Störer went to Ettlingen, or why. 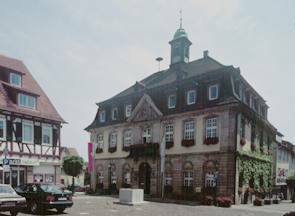 Ensingen seems likely, for the name is spelled both ways as it is in Ettlingen, thus whatever slight difference in pronunciation led to the specific spelling may have been heard in Ettlingen. 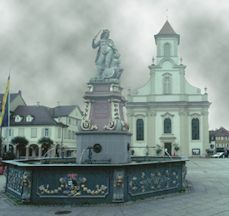 Further, there is the connection of Michael Störer in Ettlingen B: 3 Nov 1657 as the first Störer in Ettlingen, converting from Evangelical to Catholic. Josephus Bebhardus C: 30 Oct 1783?